Clothing maintains the body's micro environment best when it is worn in multiple layers, letting you adapt easily to the fluctuating temperatures in the mountains. To keep up pace with the changing conditions, add or subtract layers of clothing one by one. This layer should allow proper ventilation so that your body can cool itself. During the warmer parts of the day just wear a sweat t-shirt and long underwear covered with short pants, while during cold cover your sweat shirt and long underwear by additional layer for increasing the insulation. This layer also transports precipitation away from your skin without absorbing the moisture. This layer insulates your body by trapping warn air next to your body. The thicker the layer of trapped or "dead" air , the warmer you'll be. However several light loosely fitting layers are usually warmer than one thick garment. 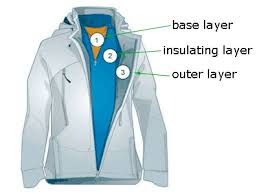 Note : Wearing multiple(2-3) layers of cotton/synthetic t shirts can act as a sweater/fleece for hiking in most the small treks in Himalayas like Triund, Bhrigu Lake, Prashar,Chandrashila etc. They are also more versatile because the various pieces ca be worn in different combinations specifically dependent upon your level of exertion. This layer is important for minimising heat loss from chilly winds and rains. Wind stirs up the warm air next to your body and blows it away, a process known as "convection". the strongerr the wind the faster heat is blown away producing a wind chill effect which makes human body feels more colder.